Identify exactly when, what and how much you want to learn. Dr. Cliff Ruddle will then design an individualized program, just for you, or a small group of your favorite colleagues, to uniquely meet your specific needs. ONE-ON-ONE training accelerates peak personal performance and is conducted in an energetic, comfortable and family-enriched environment in Cliff's private office in Santa Barbara. 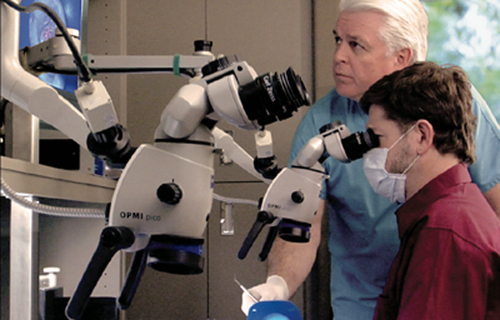 With over 30 years of teaching experience, Dr. Ruddle knows exactly how to guide you toward your practice vision. Working shoulder-to-shoulder with Cliff allows you to discuss anything and everything. 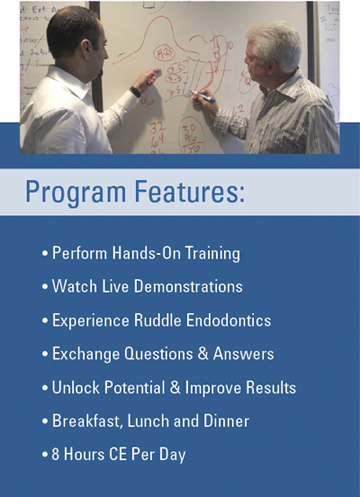 Many have said that their time with him was the single most important education day they have ever experienced in clinical endodontics. For additional information and/or to review available dates, please contact us directly at (800) 753-3636 or (805) 964-8838. Additional information regarding working with Cliff "shoulder-to-shoulder" may be watched online in the "Breakout Sessions" featured from our past Santa Barbara Hands-On Seminars.